It’s like a whole new outer space. When it was announced that Brian K. Vaughan, writer of Y: The Last Man, Pride of Baghdad and Runaways among more, was coming to Image Comics, the comic world went nuts. Then we learned he would be doing a space faring book called Saga with Fiona Staples, and our minds started going a million miles a minute. Now, four issues into the book, how has this Saga played out thus far? Saga is a mature, adult, R-Rated adventure in space. It’s like a whole new side to space, as we follow new parents Marko and Alana as they are constantly on the run with their newborn child. This brings in two factions are war with each other, and some very strange and memorable bounty hunters, all looking for this little family. By the time I reached the end of issue #4, I knew this book was for real. It had fully grabbed my attention, and left me wanting to learn more about all these strange characters. In the latest issue, #4, we see a look into the bounty hunter The Will, who you see on the cover above with his trusty living lie detector cat. This issue showed how deadly this man is, and how there are lines even he won’t cross. Confrontation and blood ensue, and by the end of it, you are left wishing there was at least one more page. Vaughan once again shows why he is a master of his craft, and Fiona Staples creates the look and feel of an all new galaxy, complete with some of the creepiest looking aliens, ghosts and animals seen. This is, by far, one of the best books on the market today. I cannot recommend Saga enough; if you are looking for some of finest sequential art, then look no further than Saga. A Pastrami Nation Prime Cut, I give Saga (issues #1-4) a perfect 5 thumbs up. 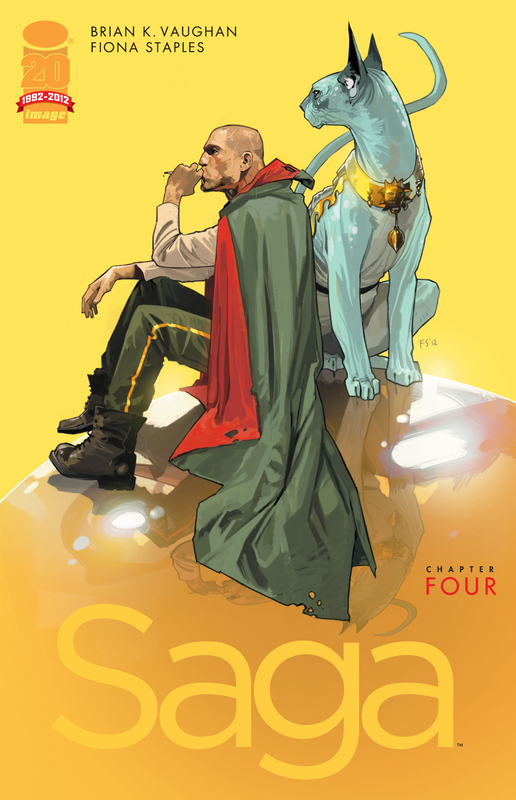 For more information on Saga and other Image Comics titles, check out Image online at www.imagecomics,com.